Mountainous West Virginia shares long borders with both Pennsylvania and Ohio, home of the highest concentrations of Amish in the country. However few Amish have chosen to settle in West Virginia. Today the state is home to 3 small Amish settlements. Amish are currently found in three locations in West Virginia. The oldest West Virginia Amish settlement is near the community of Letart in Mason County. This settlement is a single church district in size, and was founded in 1996. Another settlement is found in Summers County, near Forest Hill. This community was founded in 2006. Altogether, there are roughly 200 Amish living in West Virginia. Despite neighboring heavily-Amish Ohio and Pennsylvania, few Amish have ever chosen to settle in the Mountain state. Amish-made furniture can be found in WV in a handful of locations. Though their presence today is limited, Amish first settled West Virginia over 150 years ago. Historian David Luthy explains that the settlement at Aurora in Preston County was founded before the civil war in 1850, in what was then Virginia, as West Virginia was not yet a state. The Aurora settlement was actually paired with another group of Amish across the state line located in Garrett County, Maryland. The two sides were considered to be a single congregation despite a distance of about ten miles between them (Luthy, Settlements that Failed, p. 489). The Amish had a difficult time during the Civil War, being harassed and robbed by both Union and Confederate soldiers. Luthy notes that this experience is commonly given as a reason that the settlement eventually failed. “The frightening events during the Civil War caused the West Virginia settlers to think of moving elsewhere. No new settlers were attracted and gradually it lost its older ones through migration and death,” explains Luthy. By the early 1900s only two families remained (Settlements, p. 490-1). Eventually only three unmarried children of the settlement’s former bishop remained in Preston County, sharing a farmstead. They continued to commune with the congregation at Oakland in Garrett County across the border in Maryland. For a number of years, church was held annually at this last West Virginia Amish household (Settlements, p. 494). Eventually the remaining two sisters sold their home farm and moved to the Oakland community in 1943, bringing the Preston County settlement to an end (Settlements, p. 495). Today, the small Oakland, Maryland Amish settlement still exists, a single church district in size. Very interesting post Erik! I can understand during the civil war era and shortly afterwards not wanting to settle in that state and putting ones family at risk. But it does make one wonder why there are very few settlements there today? Alice, the reason WV has few Amish is likely the same reason the state has relatively few farms. Because WV is so mountainous, their is not enough flat land for large farms like we find in PA and Ohio. Amish need large farms. Large areas of what was once farmland has been destroyed by the timber and/or coal mining industries. Sadly it is still happening. Why not more West Virginia Amish? Hi Alice that is a good question, on the “Amish in West Virginia” blog post today Oldkat mentioned the terrain possibly being not so buggy-friendly…I really don’t know what the farming is like in WVA, I have driven through a number of times and it really is a beautiful state but it earns its nicknames. Lot of big hills and mountains. That may have something to do with it. I have lived here all my life and I am raising my children here along with my wonderful husband. West Virginia is a wonderful place to live, lower crime rates and high family values. Rich soil makes for awesome harvests! The terrain unless they are/were taking their buggies down into a holler it shouldn’t be a problem. Hi we are in morgantown would love to know where to get some amish cheese where is the closest place to get anything amish for that matter. Stacy is my name we are from Ohio where i as well have amish family. Here are names of some country stores and bulk food stores. I’m guessing they should be Amish or Mennonite. You could call some of the phone numbers to inquire directly what you have in mind. WV has very curvey mountain roads. Farming would be difficult as well for anything more than a small backyard garden. However, there are certainly other industries Amish could get into there. And the roads are paved, LOL. Perhaps a more progressive Amish community will try their hand at WV some time? I know a lot of Amish are not even farming any more. We have a lot of land that is great for farming- cows, horses and also food farms. We have a lot of widing roads but we still have horse and buggy roads in Waverly, WV. I was raised here then went into the Navy and moved back to raise my two kids here. We value our family. We are also hard working. Being rased in the dunkert church,because there wasen’t a amish,community near.That was a rough life,They stoped me in about the 6th grade,and i left at 15,went back to school,grad from,u.o.alabama,with a 93.4 ave.,,and never regreated leaving the mules back end.It’s nice to have some things now in retirement.I still have the 400 ac farm,,but grow trees now,and grand kids,god bless. Growing grandkids–I like that–wishing you many good crops. I live in West Virginia, and I never even knew that we had Amish! It would be really good for farming. We have our garden and hay field down our hollow. I wish more lived in WV so I wouldn’t have to travel out of state to visit them! lol. I could see some places being harder for them to live in, but then again they tend to stay in their communities so unlike people like me you wouldn’t have to worry about traveling out of the hollow to get to places like the mall, school, or movies, or even grocery shopping. lol. I was born and raised in Amish country and twenty-seven years ago, my husband and I moved our family to West Virginia. Since becoming a “mountaineer”, I also have become very involved with technological information. Consequently, I have read ton upon ton of material that hammers it into an accepting and complacent “English” population that Lancaster valley of Pennsylvania is THE Amish area of the USA. That is so laughable to a senior citizen now who was a little girl with blond plaited hair and feedbag dresses meticulously made by my grossmudder Della Boyer who was a seamstress in addition to being a faultless gardner, canner, quilter, tatter, knitter, sausage, ponhaus and liver-pudding maker, baker, as well as a reasonably sound author of several lost volumns of her own poetry and cookbooks. We (my brother and I) grew up in a communal family household of grandparents and parents who farmed and various other “sometimers” of the aunts and uncles living with us for vacations or just “between”. Our lives were crafted in the image of the Amish tradition although we were not religiously connected to the Amish, we WERE Pennsylvania Dutch by language (try fitting together that combination…we spoke Amish-dutch but were Catholic!!) Our preferences in food, and home style management also fit easily into the Amish culture. Most of the kids with whom I began school were also in that tradition though only two little cereal-bowl haircut and barefooted boys were of the strict ordnung and they were not in that two room school for long before they were pulled to be “home schooled”…a very curious thing to ocur in the early 1950s. I never thought of my traditional “farm” upbringing as weird, unusual nor as being “not the same” as every other kid’s home life. AND WE WERE NOT IN LANCASTER VALLEY, but rather in Snyder County Pennsylvania over a hundred-twenty miles northwest of Lancaster County. As time went forward, I was confirmed in my Catholic faith as a teenager and recall the slow trek to Sunday morning Mass behind a line of black buggies all directing themselves toward the farm hosts of their home church of the week down Route 522. 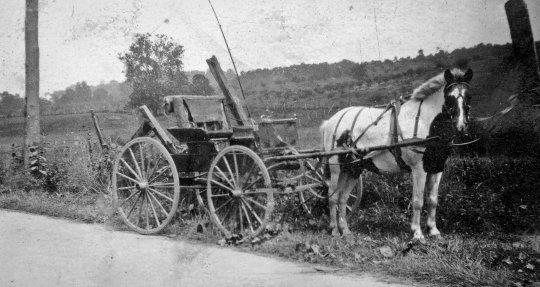 Many of the Middleburg/Kreamer area Christian families who had joined congregations of Lutherans or Catholics had church buildings in the eastern section of Snyder County in Selinsgrove and so were all in a queue of autos putzing along behind a stall of five-mile-an-hour wagons and nonchanlant horses. Father Burokowski used to hold up mass until his Middleburg altar boys arrived to serve…especially in the winter months when the roads were slick, but the steel-rimmed buggy wheels and sure-footed equines continued their ferrying of somber men in black and their families to one or the other of the Amish farms serving as the host “church home” of the week. Vicki, I loved reading this account! Thanks for taking the time to share it with us. You really have a very interesting heritage. Thank you for recognizing my unique cultural confusion;-) This site focused on observations of Amish life in central Pennsylvania, so I left out another cultural twist in my life. My father’s father…a Floridian, born and bred…had the blood of the Seminole Indian lineage in him, eagle-hooked nose and high cheek bones which he passed gleefully on to me…thanks, Dad. That was a real eye-opener for plain folks of Snyder County and they just weren’t sure how to absorb that. LOL. Do not forget about the very few Amish families in Wirt County, WV. They have a very small salvage store there. It is truly in the middle of nowhere. My family recently moved to Elizabeth, WV in Wirt County and were surprised to find out that we have small Amish group trying to establish community here. Currently, I think it’s just one or two families. However, I’ve seen ads in the local paper for Amish boys willing to do odd jobs and yard work and for Amish girls willing to do sewing, mending and cooking type jobs. I’ve also been behind their horse and buggy as it went through town and been behind them at the local market too. Trust me, it isn’t in large numbers, but they’re definitely in Wirt County. Thanks for sharing, Mike. Checking the 2013 JAPAS settlement listing, there has been a settlement in Wirt County near the town of Palestine since 2004. I’m assuming these are the same people since Elizabeth looks to be only a few miles from Palestine. Based on what you and Stephanie say, it sounds like it’s just a small group there. Didn’t the Amish in West Virgina move there from Somerset PA? I live in Wirt County and I never knew that there were any amish families in the county. Most of the people live on farms in the middle of nowhere and may seem amish but I have never heard of amish people living in Wirt County. I am not sure what part of Pennsylvania they are from. I am not an expert on Wirt County, but they live off of Turkey Fork Road. They have a large white house, a singlewide trailer, and a store with a living quarters above it. It is Miller’s Bulk Foods. There is a small sign that you really have to watch for to see. I lived in Wood County,WV from 2002 to 2006.My uncle had family in Wirt County we would visit. I never saw any Amish around there. The only time that I did see them was when we went to Holmes County, OH.We would make a day of shopping and looking in the stores.my favorite one was Heini’s Cheese Shop. Hershberger’s Bakery and Pumpkin Patch had the best little tarts with fruit filling and cream cheese on top, two for only a dollar and the sweet rolls with some cheese and a beef stick was a very good meal! It was on a dirt road off away from the “tourist trap” of downtown either Berlin or Sugarcreek or Walnut Creek, OH. It’s been so long since I was there last that I can’t remember which town it was. Does anybody know of any Amish in Doddridge County, WV? Also does anyone know if there are any Amish in or near Orma,WV? I think it’s in Roane County, WV but not for sure about that? I would really appreciate the reply. It’s been nice recalling old memories. I hope that this has helped someone. Wirt and Mason Counties are the only counties I know that have Amish. thanks!! been there before but couldnt remember where it was! Any Amish near Doddridge County? Does anybody know if there are any Amish or Mennonites near Doddridge County,WV? Yes… live is good living off the land. Hi! I live in Huntington, WV, which is very close to Mason County. Do you know if the Letart community is still present, and if so, do they operate any Amish-owned businesses there? Thank you! Wonderful website! I would like to locate a group of Amish Builders to find out if they can build a home in Grafton WV during 2015. Where is best place to find nearest builders who are truly Amish Builders to discuss this soon? I would like to locate an Amish farm to purchase Organically raised produce,eggs,and meat and scrapple. I live in Calhoun County WV. Do you know of any Amish near Hinton-Alderson area? The 2018 Raber’s New American Almanac lists an Amish settlement at Forest Hills/Ballard, W. Virginia. The two other W. Va. settlements listed are at Philippi and Letart. There is also an Amish settlement at Pearisburg, Virginia, not too far from the W. Va. border. Hello, I live in Grant County West Virginia. We have a new settlement being established now with about 200 to come from New York. I am interested in what our community should do to interact with our new neighbors. They have purchased farmland but I also know they are interested in building for other people. Their presence could be beneficial for our county and town but I am totally ignorant as to how to interact with them. Is there a central person to contact in the group? Would I be presumptuous to go and visit and welcome them to the community or do they prefer to be somewhat anonymous and separate? Any suggestions and help would be appreciated. The group in Grant County is part of the group that has also settled in Mineral County. The group set up a booth a the farmers market in Keyser this year. I’m looking for a crew to build my pole barn in Raleigh County, WV. Is Amish life really so “simple”?